Many spouses, adult children, and family caregivers shop for gifts for a senior loved one, but often have trouble finding the perfect gift. 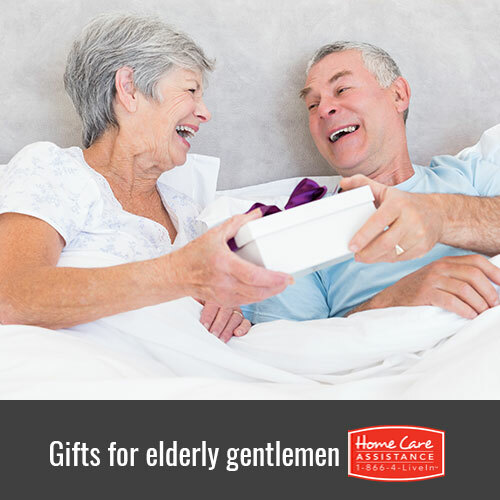 If you’re searching for a wonderful present for the senior man in your life, you might want to consider one of these great ideas, brought to you by the senior care experts at Harrisburg Home Care Assistance. Some excellent universal remotes with large illuminated buttons assist vision-impaired and motion-challenged people in controlling TVs, VCRs, and other electronic devices. Hy-Tek produces a conveniently sized, lightweight big button remote priced at $25. If your loved one has trouble bending down to tie his shoelaces, the one-size-fits-all locking elastic shoelace system from Agape might offer the perfect solution. Available on Amazon, it costs around $12.99 retail and fits any laced shoe. Magnifying Aids produces a great lightweight 500-entry address book costing under $25. It includes laminated alphabet tabs and a coated spiral binding, together with large writing spaces and a special pen designed for the visually impaired. Senior men challenged by technology can still keep the phone numbers of loved ones in an organized place. Many companies offer great selections of comfortable, cushioned slippers. Some models include adjustable straps or increased width to offer greater comfort for seniors with swollen or sensitive feet, like the slippers available from Buck & Buck, which range in price from $32 to $45. Emerson Phones offers an attractive large button phone, the EM300WH Big Button Corded Phone, for $19.99. Owners can install it with back-up power to function during outages, a big plus for many seniors. Though these items can be useful gifts, sometimes the greatest gift you can offer your loved one is home care. If your loved one can benefit from hourly or live-in home care in Harrisburg, PA, reach out to Home Care Assistance. Our experienced caregivers can help with tasks ranging from personal grooming and bathing to housework and cleaning. Call one of our qualified Care Managers at (717) 540-4663 and schedule a complimentary in-home consultation.